Gold futures claimed their first weekly increase in four weeks despite falling on Friday, one day after posting their highest quarterly gain in nearly 30 years. Gold for June delivery on Friday declined $12.10, or 1%, to settle at $1,223.50 an ounce on the Comex division of the New York Mercantile Exchange. Losses for the day were attributed to a better-than-expected U.S. jobs report. "The jobs report shows a brighter economic picture, especially the fact that wages have increased," Bloomberg News quoted Bob Haberkorn, a senior market strategist at RJO Futures in Chicago. "That’s enough for gold to trade lower today." The U.S. economy added 215,000 jobs in March, the Labor Department said. Reported forecasts were closer to the 205,000 area. Gold edged up 0.2% on the week after falling 2.6% last week. It is the strongest performer among precious metals, up $163.30, or 15.4%, since ending last year at $1,060.20 an ounce. On Thursday, gold posted its best quarterly results, surging 16.5%, since the third quarter in 1986. The outlook among market professionals is more dismal with a majority bearish on the market in the near term. Out of 35 market experts contacted, 18 responded, of which only five professionals, or 28%, said they are bullish on gold. Ten professionals, or 56%, said they are bearish, and three analysts, or 217%, are neutral." Elsewhere on Friday, silver for May delivery sank 41.8 cents, or 2.7%, to end at $15.046 an ounce. The settlement was the lowest since March 2 when the precious metal closed at $15.022 an ounce. Silver prices fell 1% on the week but they are 9% higher so far on the year. July platinum fell $22.30, or 2.3%, to $955.20 an ounce, but edged up on the week by 0.3%. Palladium for June delivery lost $3.10, or 0.6%, to $560.90 an ounce, and declined 2.1% on the week. For the year to date, platinum is up 6.9% and palladium is down 0.2%. Gold fell $23.40, or 1.9%, to $1,213.60 an ounce. Silver was unchanged at $15.38 an ounce. Palladium fell $10, or 1.8%, to $559 an ounce. 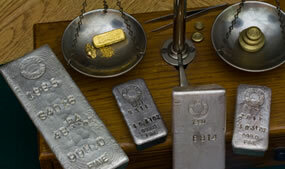 For the week, gold and palladium registered losses of 0.6% and 3.1%; silver gained 0.7%; and platinum was unchanged. U.S. Mint bullion coin performances were mixed as compared to a week ago with gold sales higher and silver sales a bit lower. Gold coin sales advanced 10,500 ounces this week compared to 8,500 ounces last week. Sales splits include 8,500 ounces in American Gold Eagles versus 7,500 ounces previously and 2,000 ounces in American Gold Buffalo compared to 1,000 ounces previously. The U.S. Mint this week again allocated 1 million ounces of American Silver Eagles. The agency is rationing their sales because of silver planchet shortages. Unlike last week, not all of them were claimed. Bullion distributors ordered 957,500, or 95.8%, of the supply. 2016 Silver Eagle sales remain on record pace at 14,957,500 coins, up 23.9% from the same time in record year 2015.